There's no doubt that they take great care into what they put into their foods, and this is inevitably reflected in the price. 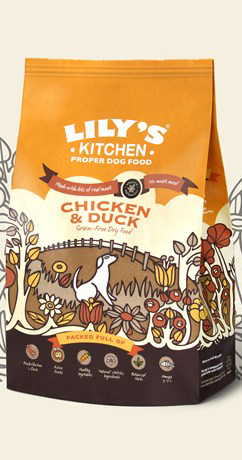 Lily's kitchen use very good quality ingredients, some being organic, and there is a large range of options from tins to trays and dry food. But unless you have a very small dog this is very expensive to feed! Expect to pay £42 for 7kg dry food (which is equivalent to £72 for a 12kg bag!). This makes it possibly the most expensive natural non-prescription dry food in the UK! Min. 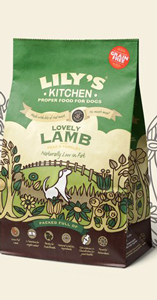 32% Freshly Prepared Lamb, Potato, Sweet Potatoes, Lentils, Linseed, Peas (3%), Pea Protein (3%), Potato Protein, Lamb Gravy, Lamb Fat, Pea Fibre, Apples, Carrots, Spinach, Cranberries, Botanical Herbs (Alfalfa, Golden Rod, Cleavers, Dandelion Root, Nettles, Celery Seed, Rosehips, Marigold Petals, Burdock Root, Milk Thistle, Chicory Root), Glucosamine 175mg/kg, Methylsulfonylmethane 175mg/kg, Chondroitin Sulphate 125mg/kg, Parsley 100mg/kg, Chelated Vitamins and Minerals. Nutritional additives: Vitamin A 15,000iu, Vitamin D3 250iu, Vitamin E 100iu, Calcium Iodate Anhydrous 1.64mg, Organic Selenium S Cerevisiae CNCM 130mg, Cupric Chelate of Amino Acids Hydrate 150mg, Zinc Chelate of Amino Acids Hydrate 333mg, Manganous Chelate of Amino Acids Hydrate 233mg, Ferrous Chelate of Amino Acids Hydrate 333mg, L-Carnitine 400mg. Chicken (31%), Duck (7%), Sweet Potatoes, Peas, Lentils, Pea Protein, Flaxseed, Chicken Liver (4%), Eggs, Chicken Gravy, Calcium Carbonate, Salmon Oil, Apples, Carrots, Spinach, Cranberries, Botanical Herbs (Alfalfa, Golden Rod Cleavers, Dandelion Root, Nettles, Celery Seed, Rosehips, Marigold Petals, Burdock Root, Milk Thistle, Chicory Root), Vitamins and Minerals. Nutritional additivesVitamin A 20,000iu, Vitamin D3 100iu, Vitamin E 95iu, Calcium Iodate Anhydrous 1.58mg, Sodium Selenite 0.64mg, Cupric Chelate of Amino Acids Hydrate 144mg, Zinc Chelate of Amino Acids Hydrate 320mg, Manganous Chelate of Amino Acids Hydrate 224mg, Ferrous Chelate of Amino Acids Hydrate 320mg.